The CP10-Tabletop Tripod from FLM is a 10-layer carbon fiber tripod that weighs only 4.2 oz and can support up to 11 lb. It is adjustable from 1.3 to 8.7", making it ideal for macro and product photography. A reversible 1/4"-20 and 3/8"-16 stud allows you to mount a tripod head or attach your camera directly to the tripod. The legs are individually adjustable by using the twist locks on the top of each leg. When locks are engaged the legs cannot open any further, however they can be folded down for transport. When they are opened again they will open until the point that they were last locked at. 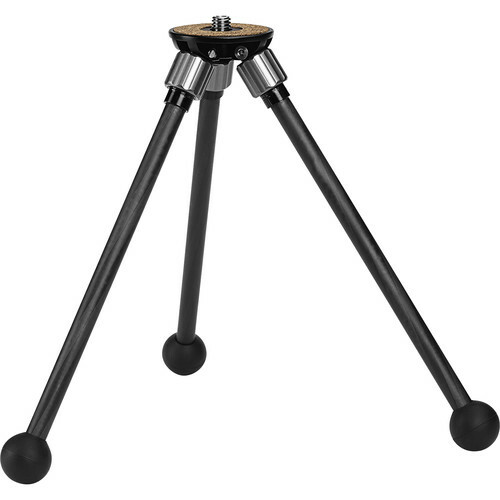 Box Dimensions (LxWxH) 8.9 x 2.7 x 1.4"
CP10-Tabletop Tripod is rated 4.8 out of 5 by 12. Rated 5 out of 5 by Kris from Perfect for my macro needs. I bought this for macro photography. My full-size tripod has a center column and about 12 inch minimum height, so I needed something that will get low. I shoot with a Canon 7DII and 100 mm macro lens with a ball head on the tripod (need a 1/4 to 3/8 adapter for this). I frequently use portrait mode and the tripod can't be set much higher than 7 inches or so to stay upright. I really love that the legs can be adjusted independently from each other as it allows for infinite configurations between min and max heights. The legs are quite sturdy and the rubber feet are sticky and do not slide. Extremely light and portable. Would buy again in a heartbeat. Rated 3 out of 5 by MikeG from Awesome Tripod - bad screws Have had this tripod for seven months and have been pretty happy. For the last two weeks I've been exceedingly happy using it for shots inside churches in Italy. I was just going to write up a how I got the shot post for my camera club and pulled the tripod out of my Scott E-Vest where it's been living for the past two weeks and one of the legs fell off. The screws that attach the legs to the tripod all backed out, one all the way two just barely hanging on. Lucky for me the screw was at the bottom of the vest pocket. Unlucky for me no hex key, but I was able to get some tightness on them with a tool on my Swiss Army Knife. I almost went down to two stars on this review. I'd give it four, maybe even five, if they packed a hex key with it and a warning to check once in a while. I checked flimsy construction just because of the screws backing out - the rest of it is really well made, not flimsy at all. Rated 5 out of 5 by Ashley D. from Awesome tabletop tripod This little tripod is awesome. Lightweight, sturdy and easy to use. I use it for long exposures while hiking/ camping. It held a Canon 5DMIII and 24-105mm with ease. Longer lenses will need to be positioned with a leg under the lens to help balance. With a small manfroto ball head I was able to get vertical shots. I will probably swap out the manfroto head for FLM's so the lever doesn't catch. Rated 5 out of 5 by Jamie T from Light, stable, slightly fiddly (I paired this with a Joby Ballhead 5K for use in tabletop photography.) The carbon fibre legs are tough yet light, and the 10 year warranty is quite a rarity in the market today. With a Sony A7II mated to a LE-EA3 adapter and a Minolta 100mm F2.8 lens, the tripod is still extremely stable at all leg angles, so you DO pay for what you get. To adjust the leg angles you basically need to screw/unscrew the silver collars located near the mounting plate. It's slightly fiddly, and not 100% precise, but it locks into an angle very confidently, so I'm alright with the trade-off. One last thing: it folds "down" into a single long package. Again, perhaps not as compact as some competitors. But I'll take this configuration with its tough, stable setup anyday. Rated 5 out of 5 by Tim from Great! This tripod is so light and sturdy, I'm not sure how it's done! I took it backpacking and didn't notice the extra weight (paired with a G-20X ball head) but got a lot of use out of the pair. Adjusting the angle of the legs isn't as quick as other systems, but still easy to do. And the feet are nice and grippy even on dusty slick-rock. Rated 5 out of 5 by Mathman from Excellent Quality Tabletop Tripod This is a premium quality small tripod that is perfect for macro photography. That is what is use it for primarily, but because of its light weight and small footprint when folded up, it would be handy to put in a backpack if you didn't want to bring along a full sized one. It is a bit pricey, but you get what you pay for. What is the diameter of the mount? Does it Not come with a mounting head? No. The ideal head for this tripod is either a CB-24E, or if you want a quick-release option as well, the CB-24FB/PRP-45 (item #12 24 903).